Steam Boat Corn Bread. Mrs. Ripley. 1 quart scalded milk 1/2 pint meal 1 tablespoon lard a little salt - stir in six eggs just before putting in the oven Virginia Corn Bread 3+1/2 pints milk 1 quart corn meal 1/2 pint wheat flour 2 eggs well beaten + a little salt 1 tablespoon butter dissolve in the milk. Mix all well together + bake in a buttered tin. Milk or Salt [rising?] Bread. Mrs. Bacon. 1 tea cup new milk 1 teaspoon salt pour in 2 tea cup boiling water - when cool so as not to scald - stir in flour to make a batter + set it a kettle of warm water until it rises up light which will be in about 5 hours - pour the batter in your pan of flour + mix with warm milk or water enough to make 4 loaves of bread 1 tea spoon soda - knead thoroughly let it rise, about half an hour, then bake. Diet Bread 1 pound sugar 1 lb. 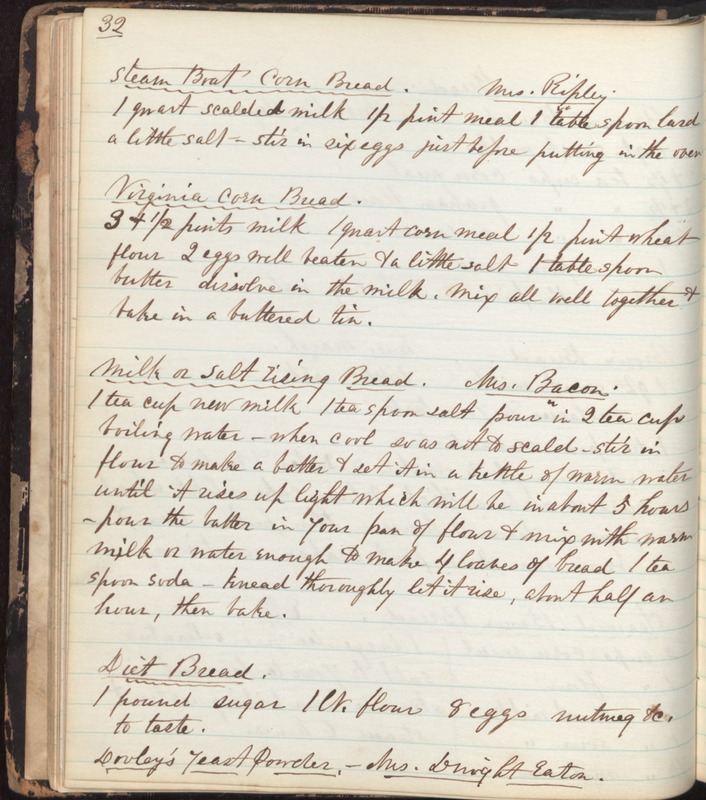 flour 8 eggs nutmeg &c. to taste Dooley's Yeast Powder - Mrs. Dwight Eaton.